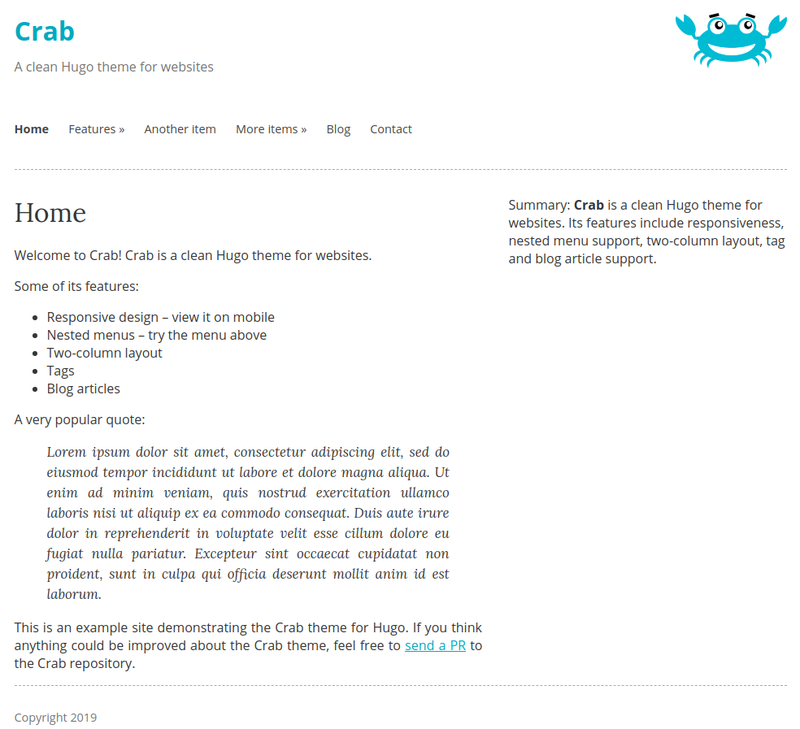 Crab is a clean website theme for the Hugo static site generator. If you’d like to get a live demo of the Crab theme locally, you could clone the repository, cd to the exampleSite directory and run HUGO_THEMESDIR=../.. hugo serve -t crab from there (assuming Hugo is already installed). Read the Hugo Quickstart Guide for an introduction to Hugo itself. Once you created a new Hugo site, you can use the Crab theme. The file exampleSite/config.toml provides an example for how the Crab theme can be configured, especially in regard to the menu items. Use the weight attribute to specify the order of menu items. Menu items with smaller numbers appear before those with bigger numbers. For every menu, specify an identifier if you intend the menu to have sub-items. In each sub-item, make sure the parent attribute matches the value of the identifier used for the parent menu. Choose a unique name for each item in the same menu. This appears in the sidebar. *Markdown* is supported! title = "A Page With Tags"
Tags will appear both on regular (fixed, static) pages as well as for blog posts, although they are probably more commonly used with blog posts. Blog posts are intended to be created in the special directory /blog/. The main difference about blog articles is that the layout includes the timestamp when they were published (fixed pages don’t show a timestamp by default) and that they appear in the list of blog articles. The exampleSites/config.toml shows the kind of permalinks declaration required to generate blog posts in the correct place. To change the logo of the crab to your own customised image, add logoimage to config.toml, where logoimage is the path inside your site’s static directory. If you think anything could be improved about the Crab theme, feel free to send a PR to the Crab repository.